ClassJuggler Creates and Launches an Industry-Leading Mobile Responsive, Mobile Friendly, User-Friendly Customer Portal for Class-Based Businesses. SAN RAMON, Calif., Sept. 8, 2017 /PRNewswire-iReach/ — Today, ClassJuggler – a leader in class-based business management software – raised the bar for class management software by launching its 100 percent mobile-responsive, mobile-friendly, user-friendly Customer Portal, and making the tool available to its clients who want to save money and reduce the burden on staff members by allowing their customers to register online and manage their own accounts. Make payments to the class-based business online – from any device. The ClassJuggler Customer Portal upgrade, which starts at just $10 per month, is available immediately to all existing and new ClassJuggler clients. 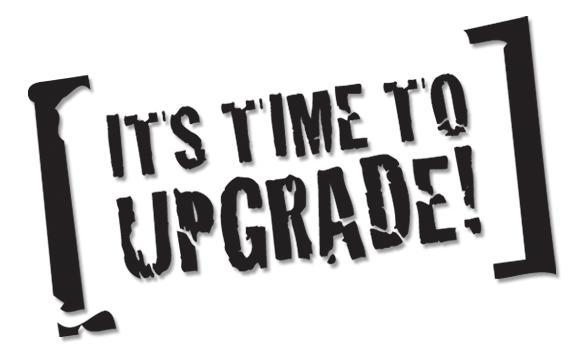 Clients currently using the Customer Self-Service Center will be able to upgrade to the new Customer Portal at no additional cost. 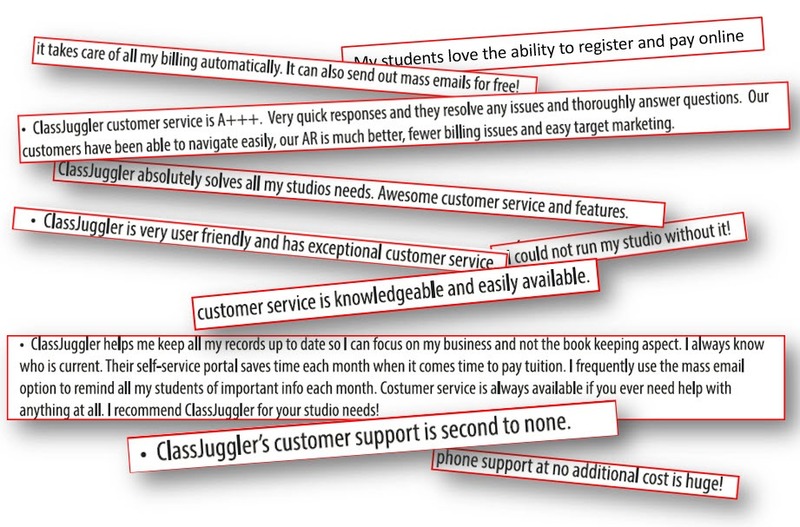 Get more information on ClassJuggler or the ClassJuggler Customer Portal. This entry was posted in About ClassJuggler, Cheer ClassJuggler, ClassJuggler Dance, ClassJuggler Dojo, ClassJuggler Fitness, ClassJuggler for Franchises, ClassJuggler K-12, Music ClassJuggler, Swim ClassJuggler and tagged class-based businesses, customer portal, customer self service, parent portal on September 8, 2017 by classjuggler. What’s the best way to get more time as a school/class-based owner and boost your profit margin? Simple: Let your customers self-manage their relationship with you from the convenience of your website! Our powerful Customer Portal tool lets your customers view and update their personal information, view their billing history, shop for classes, make payments, manage student data, view class enrollments, and much more – all with a few clicks or swipes! The most modern, mobile-optimized, Parent Portal on the market! Your customers choose a mobile device over a traditional computer 60% of the time, so a completely mobile-friendly and mobile-responsive registration site is a must! Our Customer Portal looks fabulous on every device and is super easy to use, from desktops to the smallest smartphone screen – with no pinching and zooming. Customize all of your social media links and website links. Enable or disable customer portal features. Customize multiple listings on the same page. Control fonts, styles, colors, and format of your class listings. 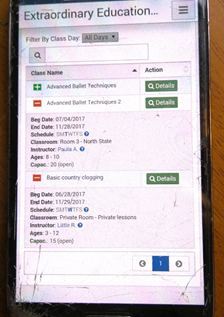 Choose bonus class features appropriate to your type of business (dance school, K-12 school, gymnastics center, cheer camp, martial arts classes, music school, tennis camp, swim school, fitness classes, etc.). Eliminate extra paperwork by adding online versions of your policies for customers to acknowledge when they register. Easily browse your class catalogue in their jammies — from the comfort of their home. Filter class views by day, time, instructor, location, etc..
Add selected classes to a shopping cart. Choose optional or required class fees, late fees, and more. Use our affordable credit card processing add-on service with the Customer Portal to let customers pay online for classes with a mobile device tap or computer mouse click using their credit or debit card, assuring you receive payments on time. No more waiting for a customer’s hand-delivered or mailed-in check! Self-register, creating a new account for themselves without you lifting a finger. 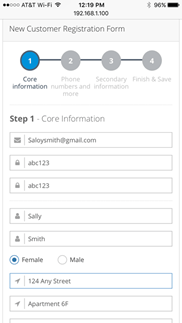 A step-by-step wizard makes self-registration a breeze! Set up and manage an on-file credit or debit card to allow for convenient one-click payments or ongoing payment schedules. Since your customer’s information is available to them online at any time, you no longer need to print out or send out confirmation mailings, payment receipts, invoices, or statements. What a time and money saver! See our parent walkthrough video to see the Customer Portal in action. This entry was posted in About ClassJuggler, Cheer ClassJuggler, ClassJuggler Dance, ClassJuggler Dojo, ClassJuggler Fitness, ClassJuggler for Franchises, ClassJuggler K-12, Music ClassJuggler, Product Info, Swim ClassJuggler and tagged customer self service, parent portal on September 7, 2017 by classjuggler. Enjoy security and control access your way! When you’re running a business, nothing is more important than the safety and control of your data. With ClassJuggler’s software for schools and studios, we respect that! We protect your school’s data from improper access, from corruption, viruses, and more. We also give you powerful administrative controls to define system access. ClassJuggler protects your records using the same data encryption used by Amazon.com, BestBuy.com, Dean and Deluca, and other major online merchants. Our Advanced User Security system gives you complete control over what access you want to allow or disallow to each of your administrative users. Easily create custom “roles” in ClassJuggler that limit what screens and reports users can access. Create an instructor role, limited to managing attendance, skills, and class enrollment. Create a bookkeeper role, providing but limiting access to financial screens and reports. Or set up a receptionist role with view-only access. ClassJuggler also lets you create role access rules, such as specifying add, update, delete, or view permissions. For example, you can limit your employees’ access to a customer’s credit card account information while allowing contact information access. This unique security feature lets you control/limit access to your ClassJuggler administration from a designated computer, or on designated days and times. The ClassJuggler security system has over 90 specific privileges, each with four individual access levels. And we’re adding more privileges all the time. This entry was posted in About ClassJuggler, Cheer ClassJuggler, ClassJuggler Dance, ClassJuggler Dojo, ClassJuggler Fitness, ClassJuggler for Franchises, ClassJuggler K-12, Music ClassJuggler, Product Info, Swim ClassJuggler and tagged data security on June 28, 2017 by classjuggler. In ClassJuggler, Hovering Is Your Friend! 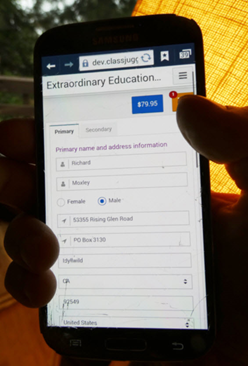 ClassJuggler tracks a phenomenal amount of data about every type of record in your database, including classes, students, parents, and instructor data. But due to limits of screen size and practicality, we help you by only showing a subset of that data in listings. But there is a trick to seeing much more! Any listing column may have additional information hidden in it, easily revealed though right when you need it. Simply hover your mouse over it. That little green symbol means there is more info that you can see while hovering your mouse. Give it a try on the last or first name columns on the Customer Listing screen. Or try the Class Name column on Class Listings. There’s a bevy of extra info without even clicking into the maintenance pages for those records. Any questions remaining? Simply contact us and we can answer your questions or walk you through it. This entry was posted in About ClassJuggler, Cheer ClassJuggler, ClassJuggler Dance, ClassJuggler Dojo, ClassJuggler Fitness, ClassJuggler for Franchises, ClassJuggler K-12, Music ClassJuggler on August 1, 2016 by classjuggler. Tip: Browse customer transactions screens quick-n-easy! Here’s a fun tip for ClassJuggler users. To browse your Customer Transactions screens quickly, or to flip through all Credit/Debit Card Manager pages for your customers, all you need to do is use the Prev Rec and Next Rec buttons at the top of the left menu allows you to move alphabetically through your customer records. This works similarly on Customer, Student, Instructor, and Class Menus. In each case, take advantage of these Forward and Back buttons to remain on the same screen. This is incredibly useful when you need to review a lot of records, whether it be reviewing agreed policies on the Maintenance Page 2 screen, or looking at account activity on the Customer Transactions screen. This entry was posted in About ClassJuggler, Cheer ClassJuggler, ClassJuggler Dance, ClassJuggler Dojo, ClassJuggler Fitness, ClassJuggler K-12, Music ClassJuggler, Swim ClassJuggler on July 28, 2016 by classjuggler. We are super-grateful to the many ClassJuggler customers that participated in the recent TutuTix survey of dance studio software providers. The input in general helps us to see where we are tops and how to prioritize our continuous product improvements. Customer service is something we pride ourselves in, because we know that customer support is important to you, our customers. If you are not yet a customer, learn more about how we can help your class-based business with our cloud-based class management software for schools. This entry was posted in About ClassJuggler, ClassJuggler Dance, Kudos from Customers on February 8, 2016 by classjuggler.